Recent research on graphene oxide may enhance our ability to fight infections acquired from hospitals and other places. Researchers from the Università Cattolica del Sacro Cuore in Rome are analyzing graphene oxide in the hope of successfully developing bacteria-killing medical devices and catheters in the near future. Bacteria can be killed by coating all surgical equipment with the carbon-based compounsd. This will result in faster recovery times, reducing the number of post-operative infections, and reducing the requirement for antibiotics. Graphene is a wonder material, initially characterized in work presented in the last 10 years and acknowledged with the 2010 Nobel Prize in physics. Characterized as a single-atom-thin sheet material, graphene also has a potential future in batteries, electronics, and manufacturing technologies. We want to make materials that will help patients and medical professionals. Graphene oxide, which is a form of graphene containing molecular oxygen, guards against infection by killing bacteria before they enter the body. The graphene oxide enfolds around the bacteria and punctures their membrane. A broken membrane inhibits the growth of bacteria and kills it. The bacteria lose their complex structure and die, and since graphene is just carbon -- a building block of life -- its cytotoxicity against human cells is much lower compared to any drug-based antimicrobial therapy. Graphene oxide was employed in this research as it has excellent stability in a water solution, allowing it to interact with human cells in an extremely safe manner. Palmieri stated that graphene ignores the human cells and attacks only the bacterial cells, however the mechanism behind this unique feature still remains unclear. Current theories highlight that the material positively interacts with the bacterial cell wall, or that mammalian cells have developed an increasing number of repair mechanisms to withstand the chemical oxidation damage caused by graphene. Graphene is also extremely eco-friendly. Conventional techniques of preventing infections consist of antibiotic therapy and tools with a silver coating, where both seem to be harmful to the environment. The compound is very effective when combined with salt. 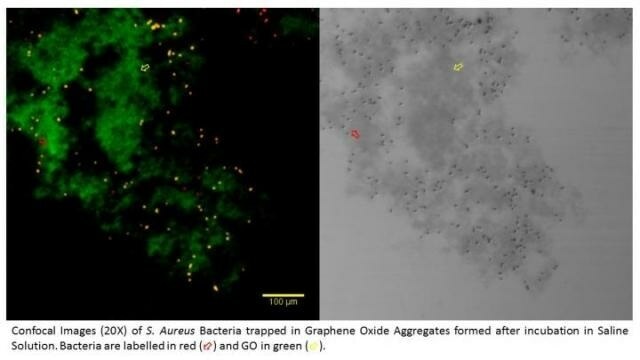 Graphene oxide with a small quantity of salt does not envelope around the bacteria. The graphene aggregates if there is excessive amount of salt, and does not puncture the membrane of the bacteria. Gram negative and Gram positive bacteria are two significant categories of bacteria, where several hospital-acquired pathogens belong. To destroy the two categories, a 300 nm-sheet of graphene oxide solution must be added to low molarity (<10 mM) Calcium chloride. Palmieri and her team of researchers developed new protocol methods to examine the salt mixture and the graphene oxide. Generally researchers use a spectrophotometer to analyze if the solution has eliminated all of the bacteria, this method did not account for the bacteria that may have landed at the bottom of the solution. Palmieri detected for bacteria using two varied wavelengths of light that are sensitive to scattering or sensitive to absorbing. The next step focused on examining graphene oxide's impact on fungi, which is also capable of causing major issues if an open wound is infected. Fungi cells are currently considered to be too large for graphene oxide to wrap around them. Palmieri believes that by adjusting the amount of salt present in the saline solution, this problem could be easily solved. Presentation #2610, "Towards a "green" antimicrobial therapy: Study of graphene nanosheets interaction with human pathogens," is written by Valentina Palmieri, Massimiliano Papi, Francesca Bugli, Mariacarmela Lauriola, Claudio Conti, Gabriele Ciasca, Giuseppe Maulucci, Maurizio Sanguinetti and Marco De Spirito. This work was presented on March 2, 2016, at the annual meeting of the Biophysical Society in Los Angeles.